A Japanese HII-B rocket launches the unmanned Kounotori 6, or H-II Transfer Vehicle 6, toward the International Space Station on Dec. 9, 2016 from the Japan Aerospace Exploration Agency's Tanegashima Space Center. The spacecraft will arrive at the space station on Dec. 13. A robotic Japanese cargo spacecraft has begun its four-day journey to the International Space Station (ISS). The uncrewed H-II Transfer Vehicle 6 (HTV-6) launched Friday (Dec. 9) at 8:26 a.m. EST (1326 GMT; 10:26 p.m. Japan time), rising into the skies above southern Japan's Tanegashima Space Center atop an H-IIB rocket. You can see our launch video recap of HTV-6's nighttime launch here. "Also aboard the re-supply vehicle are six new lithium-ion batteries and adapter plates that will replace the nickel-hydrogen batteries currently used on the station to store electrical energy generated by the station's solar arrays," NASA officials wrote in a statement. "These will be installed during a series of spacewalks currently scheduled in January." 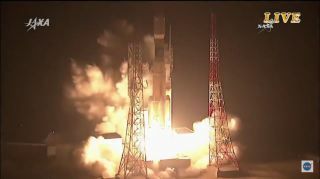 The freighter, which is also known as Kounotori 6 (after the Japanese word for "white stork"), is scheduled to arrive at the ISS early Tuesday morning (Dec. 13). ISS crewmembers will grapple HTV-6 using the orbiting lab's robotic arm, and will install the vehicle on the Harmony module's Earth-facing side, NASA officials said. Today's successful liftoff comes just eight days after a Progress loaded with more than 2.5 tons (2.3 metric tons) of cargo fell back to Earth, apparently doomed by an issue with the third stage of the vessel's Soyuz rocket. The ISS re-supply fleet has experienced a number of such failures recently: Rocket problems scuttled a Cygnus mission in October 2014, a Progress flight in April 2015 and a Dragon mission in June 2015. All three craft bounced back after these failures, subsequently flying successful missions (though it's unclear when Progress will fly again after last week's mishap). The HTV fleet has a spotless record to date; all five previous Kounotori craft made it to the ISS successfully.